To achieve the quick and accurate calibration of the geometric errors of NC machine tool, a new method with laser tracker on the basis of space vector’s direction measurement principle is proposed in the paper. A series of measuring points are mounted on the moving part of the machine tool, and then adjacent measuring points are connected to form a space vector respectively. Due to the motion error of the machine tool, the direction of the vectors composed will be changed. Meanwhile, the deviation of vector’s direction only relates to angular displacement error rather than linear displacement error. Based on the characteristic, the change of vectors’ direction is measured by laser tracker based on the multi-station and time-sharing measurement during the motion of machine tool, and then the angular displacement errors and linear displacement errors of each axis can be accurately identified successively, which reduces the complexity of error identification. 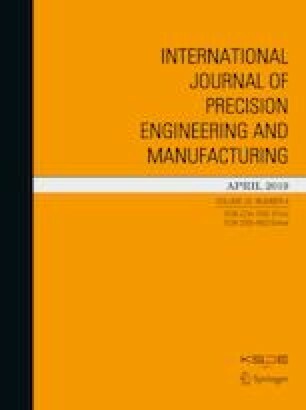 By establishing the mathematical model of geometric error measurement of machine tool based on the principle of space vector’s direction measurement, the base station calibration algorithm by measuring the motion of the designed precise turntable, the measuring point determination algorithm and geometric error separation algorithm are derived respectively, and the accuracy of these algorithms are verified by simulations. In addition, the results of the experiments show the feasibility of the proposed method. This research was supported by National Natural Science Foundation of China (Grant No. 51305370), China Postdoctoral Science Foundation (Grant No. 2015M572491), and Fundamental Research Funds for the Central Universities (Grant No. 2682017CX025).